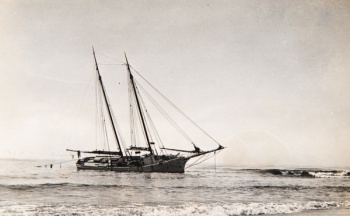 Schooner Santa Cruz (1893-1960) under sail. 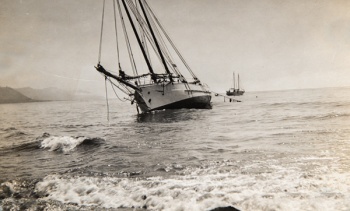 On December 6, 1960 while anchored at Prisoners’ Harbor, the Santa Cruz parted her mooring and was wrecked on the rocks on the west side of the harbor. 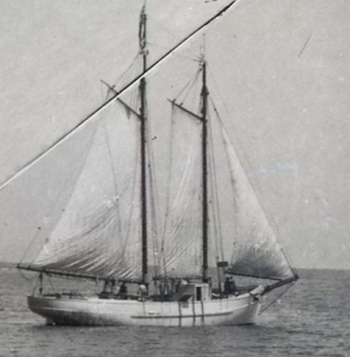 Some of her parts, including compass, anchor chain and cowl vents were salvaged. For over half a century the local papers reported on her activities. 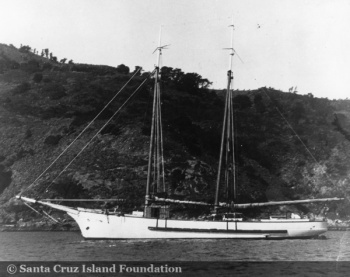 June 27, 1893 [SBDI]: “The local authorities on seamanship, sailing, vessels, and the like, have been in a deep study all day, trying to discover the correct meaning of a ‘twin craft,’ such as the Santa Cruz was described as being in this morning’s paper. Several different probable meanings have been suggested, but whether or not the true inwardness of the matter has been reached is uncertain. Will the nautical editor of the Press please enlighten an anxious public? Did he mean that the Santa Cruz has twin screws; or that she has a twin sister, or what? 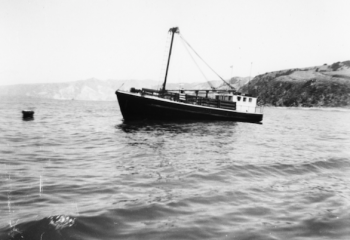 December 6, 1960 while anchored at Prisoners’ Harbor during a nor'easter, the Santa Cruz parted her mooring and was wrecked on the rocks on the west side of the harbor. Some of her parts, including compass, anchor chain and cowl vents were salvaged. This page was last edited on 8 January 2019, at 09:42.